In person and in this column, I always give sports fans a hard time for having such bitter rivalries. I mean, really, why does it matter what color jersey your team is wearing? You’re all fans of the same thing, right? Well, I haven’t been entirely honest with you guys on this score. The world of comic books—and geekdom at large—has rifts that look exactly as big and stupid as sports rivalries. We have massive tears in fandom like Star Wars vs. Star Trek, or old Star Wars vs. new Star Wars, or Doctor Who vs. everything. 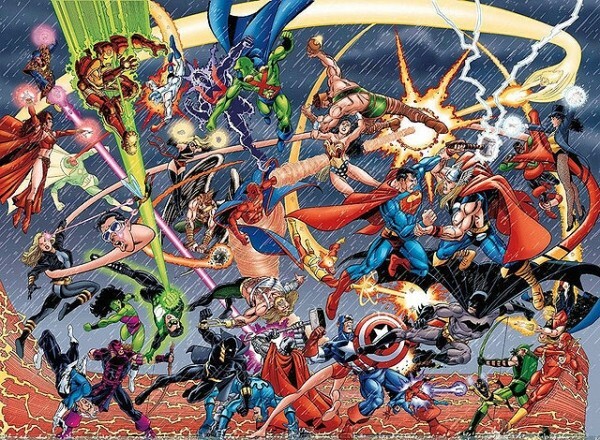 But one of the most bitter rivalries seems to be between DC Comics fans and Marvel Comics fans. For those of you still lost, DC Comics is the home to The Justice League: Batman, Superman, Wonder Woman, Green Lantern, The Flash and more. Marvel Comics is the home of The Avengers, The X-Men, Spider-Man, The Fantastic Four and many more. I’ve heard grumblings from fans of The Avengers that they actually want The Dark Knight Rises to fail at the box office to prove once and for all which universe is the best. The Avengers came out in May and has grossed more than $1 billion worldwide. The Dark Knight Rises is the follow-up to The Dark Knight, the second-highest-grossing comic-book film of all time. For many fans like myself, it’s easy to live in both worlds. I spend most of my time in the DC Universe because Batman is my favorite character, but I can switch between worlds with ease. For others, though, they would just as soon gouge their eyes out than read a comic from an opposing universe. There’s also a third faction in comics, and that’s the “creator-owned-only” crowd. I admire their goals, but I like too many kinds of comics to stick with them. When I owned a comic-book store, I witnessed this bitter animosity firsthand, and I think, more than anything, it’s hyperbole getting the better of people. For those who like DC Comics, the heroes are larger than life and truly super. They’re gods among men, and reading their exploits makes you feel elevated to that level. For Marvel fans, the characters are much more human, flawed and relatable. You can much more easily imagine yourself thrust into a Marvel comic book. or both sets, it’s really a geek-soap-opera world where we get wrapped up in the inner drama of each of our favorite character’s lives. Why would I care about Peter Parker having to give up his wife in a Faustian bargain to save the life of his aunt, when what I really care about is how in the world Batman is ever going to defeat the Court of Owls, and just how involved is the Grayson family? Yes, it’s all about preference, and it’s all about where we’ve invested most of our energy, but having ill will toward someone else because they don’t share our preferences seems so ... sports fan. If nothing else, we can all agree that we’re better than the jocks, right? It’s easy to get sucked into hyperbole if you’re rooting for a team. And what better teams are there than The Avengers or The Justice League? There are no better teams out there. I was there waiting in line for The Avengers, and I’ll be there waiting in line for The Dark Knight Rises. I love the entire spectrum of geek media, and I’ll support all of it as best I can—because I want to see more of it, regardless of the universe it’s from. It’s OK to like it all. And if you don’t like it, that’s fine, too. Just chill out about it.